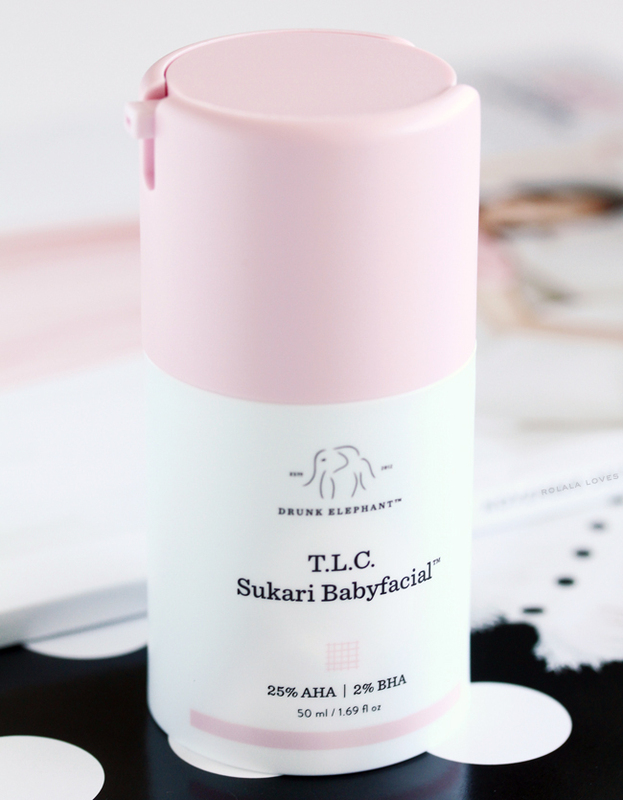 I've probably professed my love for the Drunk Elephant T.L.C Sukari Babyfacial on here many times before and it's still a staple in my skincare routine. As a sensitive skin type, I've always been wary of at-home peels until I tried this treatment. I was intrigued awhile back when I heard that Deciem’s The Ordinary 30% AHA and 2% BHA Peeling Solution was a possible dupe for Babyfacial so I thought I'd look into it. Note: I'll only be talking the products in this post and not going into anything about the brands themselves or their recent feud. I will say that Drunk Elephant and The Ordinary as brands are fundamentally different in a number of ways even though some of the products they make appear to be quite similar. Product Claims: A pro-quality AHA/BHA mask that works as a "facial" to dramatically smooth texture, minimize the look of fine lines, wrinkles and pores and boost overall clarity to reveal fresh, radiant, baby-soft skin. Directions For Use: Use once weekly. Apply an even layer to clean, dry skin. Leave on for 20 minutes. Rinse thoroughly with lukewarm water and pat dry. Product Claims: A water-based exfoliating mask with alpha and beta hydroxy acids. This treatment exfoliates at multiple levels in the skin to fight acne and restore an even, radiant tone. It also smooths the skin’s texture and reduces the look of fine lines with regular use. Directions For Use: Use ideally in the PM, no more than twice per week. Clean face and wait for skin to dry. Do not use on wet skin. Apply evenly across face and neck using your fingertips. Leave on for no more than 10 minutes. Rinse with lukewarm water. Ingredients: Glycolic Acid, Aqua (Water), Aloe Barbadensis Leaf Water, Sodium Hydroxide, Daucus Carota Sativa Extract, Propanediol, Cocamidopropyl Dimethylamine, Salicylic Acid, Potassium Citrate, Lactic Acid, Tartaric Acid, Citric Acid, Panthenol, Sodium Hyaluronate Crosspolymer, Tasmannia Lanceolata Fruit/Leaf Extract, Glycerin, Pentylene Glycol, Xanthan gum, Polysorbate 20, Trisodium Ethylenediamine Disuccinate, Potassium Sorbate, Sodium Benzoate, Ethylhexylglycerin, 1,2-Hexanediol, Caprylyl Glycol. These are both chemical peel products formulated to target fine lines, texture and dullness. They can be both used in topical mask form. Both products work by sloughing off dead skin cells to promote a brighter and more even-toned complexion. The most obvious one is the price with the Babyfacial costing $72.80 more than The Ordinary Peel. You get 30ml of product in the Ordinary Peel and 50ml of product in the Drunk Elephant Babyfacial. While these are both clean, cruelty-free formulations built around the same major ingredients (Tartaric, Citric, Lactic, Glycolic and Salicylic acids) there are some key differences. 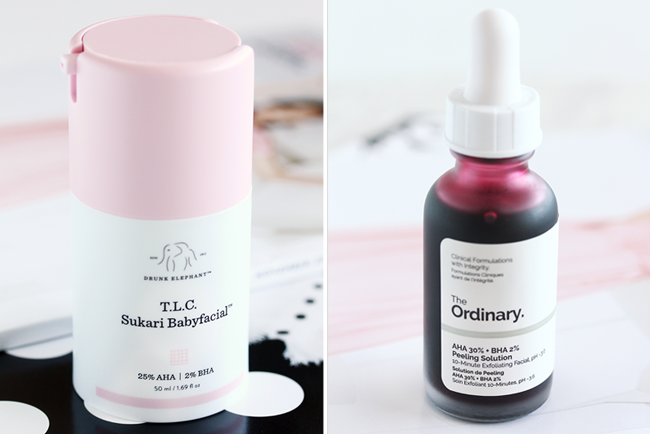 Drunk Elephant’s Babyfacial contains 25% AHAs and The Ordinary’s version contains 30% AHAs. They both contain the same BHA concentration and sodium hyaluronate crosspolymer, a lower molecular sized hyaluronic acid that is more readily absorbed by skin. 25% AHA blend (glycolic + (T) tartaric, (L) lactic, (C) citric acids): exfoliates surface dead skin cells and revs up surface turnover to smooth and brighten the appearance of skin. 2% salicylic acid (BHA): penetrates and exfoliates inside pore walls as well as on the surface of the skin, unclogging pores and providing greater skin clarity while also soothing redness. Chick pea flour: balances and brightens skin’s appearance while combating dullness. Matcha (green tea leaf), milk thistle & apple extracts: potent antioxidant blend to neutralize pollution and environmental attack, helping to condition and soothe skin. Pumpkin ferment extract: a rich source of fatty acids and antioxidant components carotene, lutein, and carotenoids; contains naturally occurring enzymes that aid in gentle exfoliation. Pomegranate extract: potent antioxidant properties neutralizes pollution, free radicals and other damaging environmental stressors. Cactus extract: soothes redness and sensitivity, helping to calm skin while using topical AHAs. Passionfruit seed oil: has antioxidant properties, improves dryness and soothes redness. Virgin marula oil: super-absorbable oil, high in critical antioxidants and omegas 6 and 9, helps hydrate, nourish and rejuvenate skin. Niacinamide: also known as vitamin B3 and nicotinic acid, niacinamide is a potent “cell-communicating” ingredient that restores aging skin and helps prevent moisture loss. Sodium hyaluronate crosspolymer: has a smaller molecular weight than hyaluronic acid and is able to deeply penetrate skin, delivering excellent hydration and reducing the appearance of fine lines and wrinkles while promoting firmness. 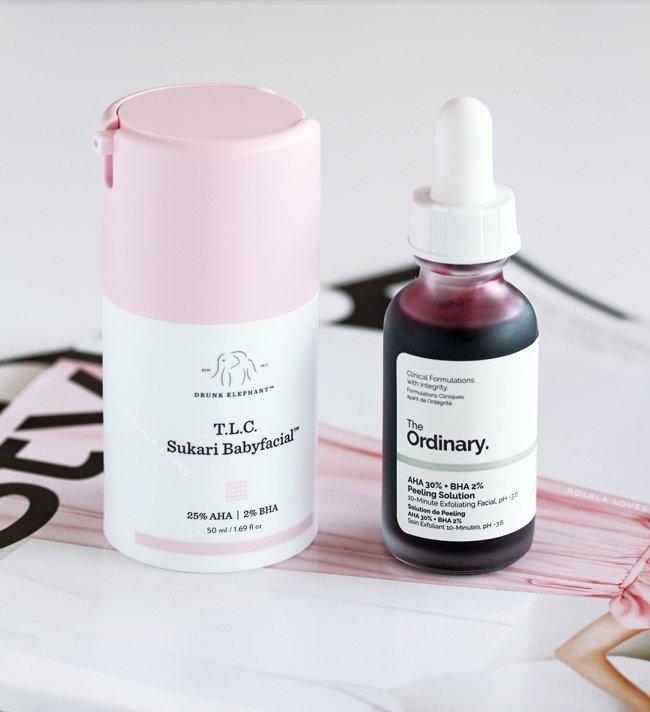 Drunk Elephant TLC Sukari Babyfacial is packaged in an opaque white plastic container with a pink top that can be considered esthetically pleasing. The product is dispensed via an airless pump. The Ordinary AHA 30% + BHA 2% Peeling Solution is packaged in a clear glass bottle with a clinical appearance. The product is dispensed out of a dropper. Drunk Elephant TLC Sukari Babyfacial is a beige cream with a fine granular texture. The Ordinary AHA 30% + BHA 2% Peeling Solution is red in appearance which it gets from the pepperberry. It kind of resembles blood and has a slightly viscous, runny texture which makes it a little tricky to use. This will stain if you're not careful. Drunk Elephant TLC Sukari Babyfacial has no discernible scent. The Ordinary AHA 30% + BHA 2% Peeling Solution has a sour vinegar-like scent which is not particularly pleasant or reassuring. Drunk Elephant TLC Sukari Babyfacial has a slight cooling feel upon application without any tingling. It starts to feel a touch warm towards the end of the 20 wear time. The Ordinary AHA 30% + BHA 2% Peeling Solution stings upon contact and the sensation doesn't really subside during the wear time. This happened during my patch tests and also occurred the few times I tried it on my face. There was only one time when the initial sting wore off and I was able to leave it on for the full 10 minutes but most of the time I didn't usually wait out the time because I didn't want to irritate the heck out of my skin. While the Ordinary doesn't make any claims that this product is suitable for sensitive skin, my skin isn't particularly sensitive these days since I've really worked on building up my skin barrier in the past year. It was ridiculous how much it burned when I patched tested it on my arm and top of my leg which aren't sensitive at all. Drunk Elephant TLC Sukari Babyfacial leaves my skin feeling ultra smooth, baby soft and not dry. It usually looks even better the next morning. The Ordinary AHA 30% + BHA 2% Peeling Solution leaves my skin feeling red and slightly inflamed but not dry. I usually have to use a calming product afterwards to get it back to normal. 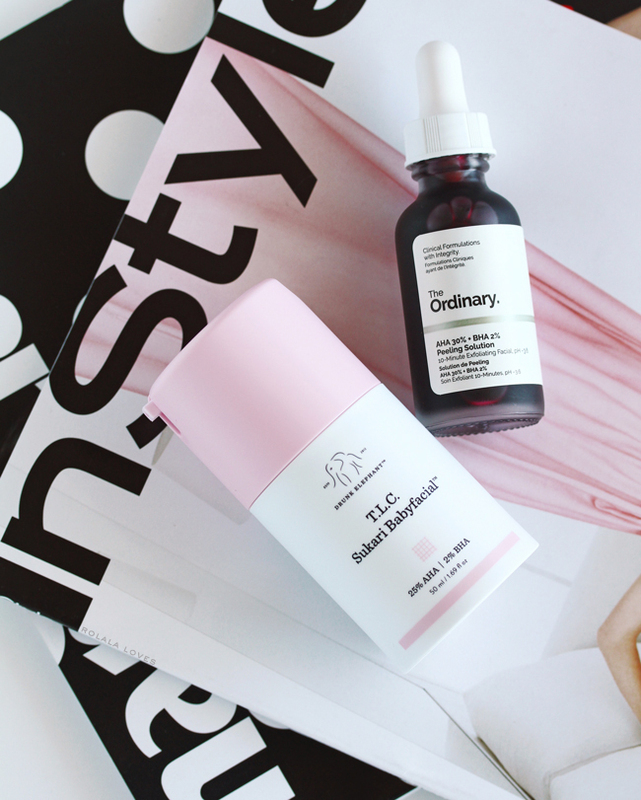 After a thorough trial of both of these products, the clear winner for me is the Drunk Elephant TLC Sukari Babyfacial for it's non-irritating performance and overall results. While this product doesn't really do much to impart a glow it does an amazing job of refining the appearance of my pores and improving overall clarity. The Babyfacial just feels like higher quality product all around and it has never irritated my skin. I use it once a week with no issues. I tried the Ordinary product on three separate occasions and each time it stung and turned my face red to some degree. It was just too harsh which in made it a less than positive experience. While I am a fan of some of the Ordinary's products and they do make some pretty great dupes, I would say that there's no comparison in terms of the experience and you get what you pay for here. I had my husband (who has oily skin) try it and while he experienced some tingling, it didn't really bother him as much. Other than making his skin a bit softer, there weren't really any noticeable results in terms of texture of tone. While it didn't work for us, that doesn't mean it won't work for you. Everyone's skin is different but I would strongly caution anyone with sensitive or reactive skin to stay away. 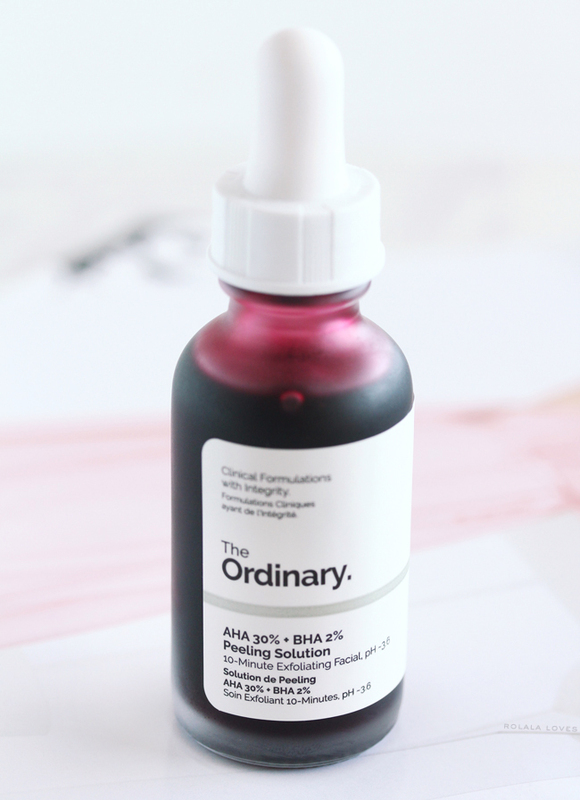 The Ordinary AHA 30% + BHA 2% Peeling Solution might be a suitable for someone with normal skin looking for a budget friendly, no-nonsense chemical peel product. I'll be sticking with the Drunk Elephant TLC Sukari Babyfacial. Yes it is expensive but it works effectively on my skin and I enjoy using it. That justifies the price tag and I'm already on my second bottle. Have you tried either one of these products? These products were purchased by me. This post contains affiliate links. I think what many people forget is that the The Ordinary products are meant to be affordable and stripped back formulas with the aim to make high performance ingredients available to a broad audience on a budget. They have to comprimise somewhere and that is on the pleasant experience upon usage. The formulas are effective, but not luxurious. A great comparison, and I think I would opt for the Drunk Elephant one as well. There is a difference between budget and high the ingredients will be missing ones that make the high luxury or less productive in expectation some low budget products do surprise us. This product I never heard of before and thanks to you know more about it. Ooh thanks for this! I ordered the baby facial recently and also have been very intrigued by the Ordinary. I'll certainly still try out a product or two from their line. But yikes that it was so irritating for your skin. I think it'd probably be ok with my skin but could see that I would probably need to layer additional brightening products with it. Rowena, I've never tried any of these lines sadly. I do want to try the Drunk Elephant for the longest time but the kit I want with the trial sizes is always sold out in the Sephora by me. Unfortunately, my skin really hates salicylic acid so I can't try both, but if I can, the Drunk Elephant seems like the way to go. We all want something that minimises the look of wrinkles whilst still maintaining firmness, and I'm glad that this is suitable for oily skin as well. I could definitely see myself trying out these products. This is hands down one of my top 3 favourite posts from you, Rowena. What an great comparison post and I love the breakdowns. Many swore by The Ordinary Peel but I am hesitant to try it because it's such a high concentration. I exfoliate my skin regularly so I don't see the point of me using a peel. If I am to choose then I would definitely opt for the DE. 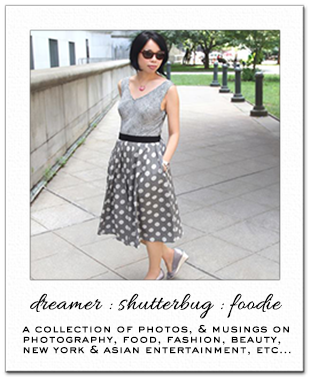 Thanks for reviewing these products Rowena! I haven't tried either of the products, but this information is helpful! Have a great week! Thanks for this comparative review. Love that you included ingredient lists for both! i’m terrified of at home peels, I have a friend that does them weekly and she’s also had a few mishaps. Maybe I’ll bite the bullet and just try it. I’m really interested in The Drunk Elephant TLC Sukari Babyfacial. I'm always up for a good facial. Such a great comparison post! Clearly, The Drunken Elephant is a winner. A product that cleans one skin thoroughly but doesn't irritate it and makes it looks even better a day after is a keeper! Ordinary does seem like a good second option, though. I can see why you wouldn't want to stick with a product that makes your skin red, even if it doesn't damage it or causes irritation in any other way. I don't think I would want try it, as my skin has been increasingly sensitive of late but for people whose skin isn't sensitive, Ordinary might be perfect. I had a feeling Drunk Elephant was going to win this one Rowena! Stinging, long term tingling nor redness is ever good. You've saved me some money! LOL I just tried DE Whipped Cream. I'll have to do a review. Although nice, it's not enough for my dry skin. I can't wait to try the babyfacial. I'd love to try either one of these. These two products sound both amazing, I need to try them! Very interesting.. the red color is amazing. I've always wanted to try Drunk Elephant product but i found it to be too expensive HAHA The Ordinary products however... the total opposite! haha! thank you for your review! Thank you for this amazing comparison post! I've been interested in Deciem/Ordinary products but their complicated product lineups are always a bit of turnoff for me. Glad to hear you have a non-irritating yet effective acid option in handy! I should look into DE range myself. This is such a great comparison post! I've stopped using strong exfoliants with high % of acids, so neither product appealed to me initially, but after reading your review I'm kind of curious about the Babyfacial now. I've never actually tried anything from The Ordinary, but after hearing too many stories about the hits & misses and then all the drama that happened, I'd rather pay more for better products and support a better brand. This was seriously such a good blog post! There was so much detail and I actually learned a lot! Thank you for taking the time to do this! I use the Ordinary's peel and think it's great! If I had to give that product up due to skin irritation then I would prob try the DE peel. I've tried so many different skin treatments and products, that now I won't spend a lot of money on something unless it provides clearly superior results for me vs something less expensive. I use the skincare money that I save buying no frills products to pay for things like professional peels or laser treatments.